Singapore saw a deluge of small plate eateries a while back. 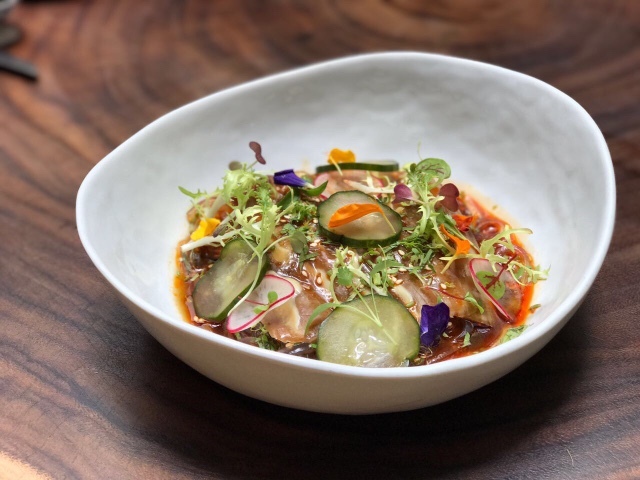 While many profess to serve rustic and, no doubt, delicious small plates, none serves a cuisine as interesting as the one we’ve tasted at Birds of A Feather (“BOAF”). Admittedly, BOAF is not your usual small plate eatery. Opened from 10am till 12 midnight, this shop house-based eatery at Amoy Street bills its cuisine as contemporary western with a pronounced Szechuan influence and it is, first and foremost, a café, a bar and an all-day diner offering an array of Szechuan-inspired menus – namely small plate, lunch, dinner – catering to patrons who arrive at different times of the day. You can completely walk in to savour a slice of cake with coffee brewed from beans roasted in China by the owner’s chain of 40 cafés branded Good Wood Coffee, most of which are in Chengdu. Or, better still, stay for a meal. It helps to know that French-trained executive chef, Eugene See, cut his teeth at Guy Savoy and at BOAF, he’s aided in the kitchen by Szechuan chefs from Chengdu. 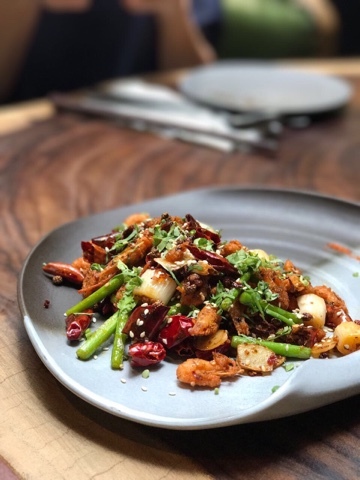 While it offers a lunch menu (12pm to 3pm) and one for dinner (6pm to 9.30pm), BOAF’s blue ribbon dishes are mostly tucked away in a menu labelled “small plate” and available all day from 11.30am. To pique your appetite, order the braised pig’s ear (S$18++) served chilled in an invigoratingly piquant hot and sour dressing over a mound of see-through arrowroot “noodles”. 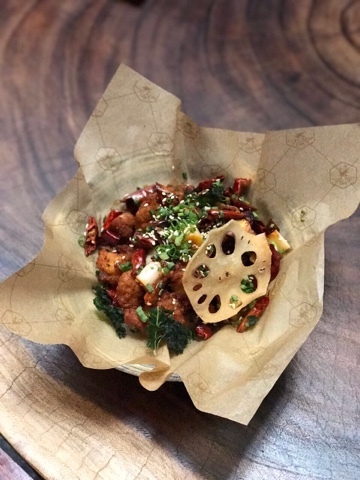 The name “fortune skewers in Szechuan pepper pepper broth” (S$19++) may not sound appealing but order it. 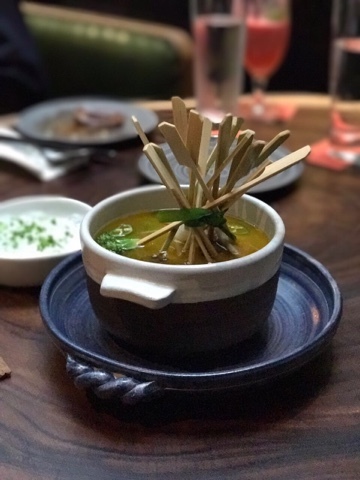 A riot of skewered vegetables and proteins including broccoli, quail’s egg, prawn and lotus root arrives at the table partially bathed in a deeply savoury, lightly spicy peppercorn chicken broth. It’s good on its own but even better with a side order of arrowroot “noodles”. Fried food will never go out of fashion and at BOAF, there’s tasty fried food aplenty. 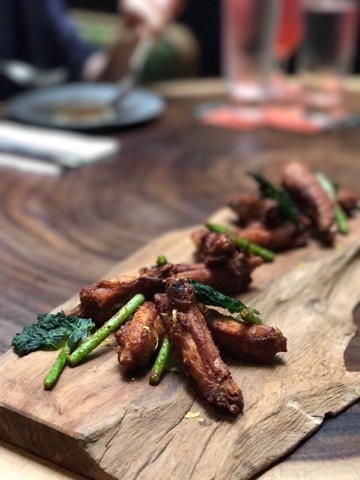 The highlight might just be the Szechuan spice-dusted crispy chicken winglet ($16) with garlic shoots. And if you want more, get a plate of bite-sized deep-fried kawa ebi in dried chilles ($17) – the crisp and juicy ebi is eaten whole with its head and shell intact. If you must have carb, look no further than the hot and sour chazuke (S$25). Available exclusively from the lunch and dinner menu, this hearty comfort dish arrives with a mound of cooked Niigata rice topped with a chunk of ikura-flecked charcoal grilled barramundi. 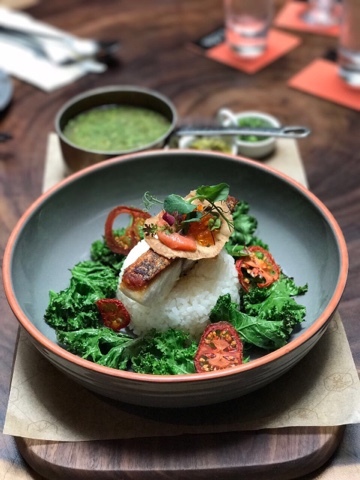 At the table, the server pours a green broth (prepped with chilli padi, Hainanese yellow chilli, pickled mustard green and fish broth) into the rice and it morphs into this appetizing soupy rice dish that you will not want to share. 115 Amoy Street 01-01, Singapore 069 935; +65-9755 7115.